Ohhhh do I have a sweet treat for you!! I have been on a mission, trying out different types and wondering what would you like? Hmmm, add this, add that take this out and ohhh, add that!!! So I did it, I came up with a tasty treat that won’t hurt your waistline. Let me introduce to you my newest coffee drink of the year!! Please give a warm welcome to Chocolate Cherry Jubilee Frappe. 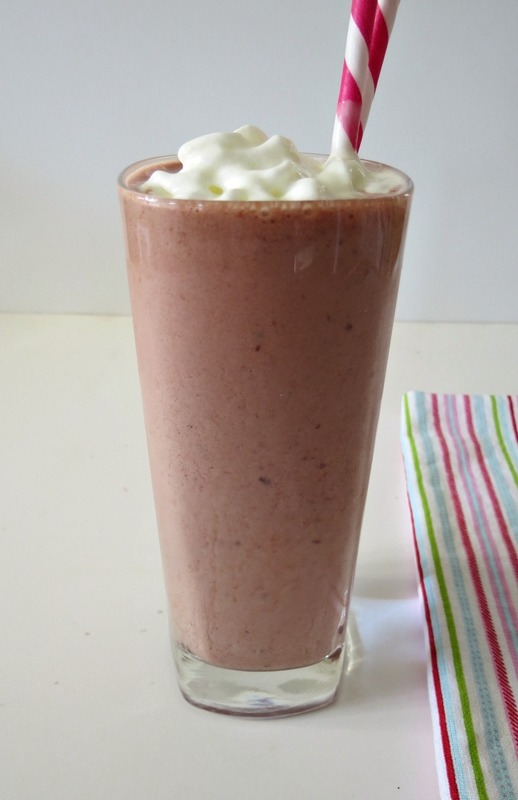 This frappe is chocolaty, sweet and has the nicest cherry taste to it!! 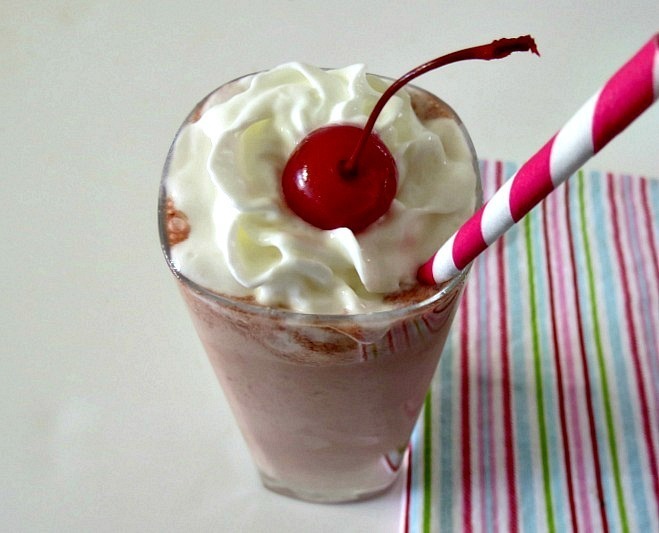 It’s almost like a cherry milkshake! I know, I know, frappes in January? Umm, yes!! There is no wrong time to have a frappe!! 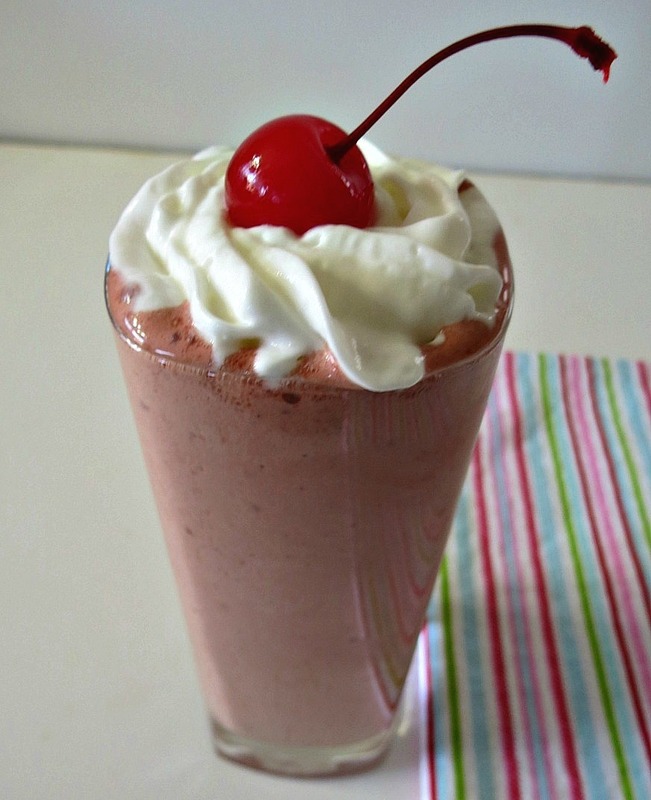 I made this frappe using 1 1/2 cups frozen coffee, partially thawed, 1/2 cup frozen cherries, 1 tbsp. unsweetened cocoa powder, like Sharffen Berger, 2 tbsp. of maraschino cherry juice, you know the juice in the jar of cherries, 1/4 tsp. stevia and unsweetened coconut milk. 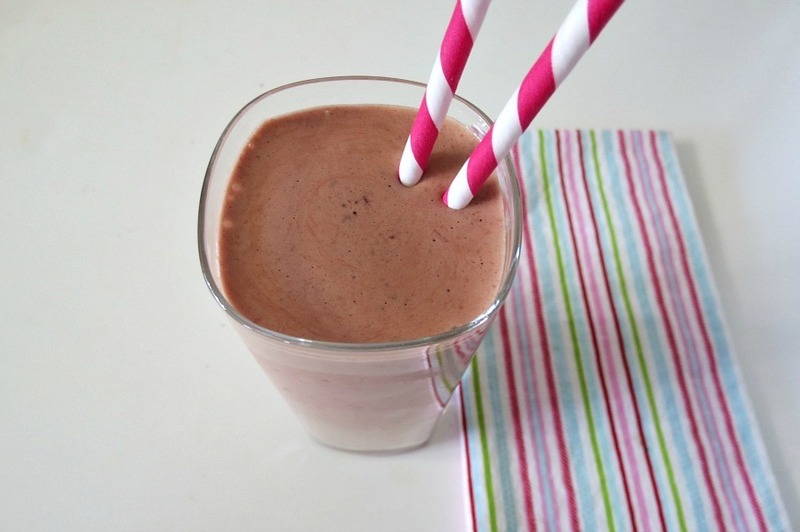 Blended it all together and came up with this chocolaty drink! It turned out WAY better than I ever imagined!! I get lots and lots of questions about my coffee, so I thought I would answer the questions I always get. For the frozen coffee, there are a few things you can do. One, use cold coffee and add a handful of ice cubes into the blender, Two freeze your coffee in ice-cube trays for easy blending, or three you can freeze your coffee in a flat freezer safe container. To defrost I microwave it for about a minute then break the ice apart. Defrosting it in the microwave doesn’t warm the coffee at all. For the coconut milk, I use Trader Joe’s unsweetened coconut milk, it’s in the isle with the almond, rice and soy milk and is only 60 calories for one cup. You can check out my Trader Joe’s page to see the picture, it’s in my top 10 TJ’s items. Whatever you do, don’t use coconut milk in the can. That will make a horrible, greasy coffee. I am sure you can sub almond milk, regular milk or even soy milk. In this drink , you do not get a coconut taste at all from the milk. I like to use it because it is creamy. This is really a fun drink. If you’re not a fan of coffee, eck!!! Just kidding, I am sure you can add one cup of milk of your choice and follow the rest of the directions. Then you get a nice chocolaty cherry milkshake!! Just be sure to add some ice cubes!! One thing I learned from making frappes is that the longer you blend the drink, the more creamer and smooth it is. When I first started, I didn’t blend so much, but now it is so much better. If you want to thicken the drink more and get a BIGGER portion, add about 1/8 of a teaspoon of xanthan gum. This stuff makes your drink grow. This recipe in general makes 4 cups, two servings, but if you add the xanthan gum, it made it almost 6 cups. It actually was growing when I photographing because the whip cream started to go over the edge so I had to sip it. How horrible! lol Oh and the cherries, I used Target’s Market Pantry Brand, found in the frozen section. I always buy at least one bag when I go to Target! I bet you’re wondering the calories for this drink. Like I said the recipe makes four cups and it’s a two cup serving size, which is only, drum rolls please, 46.2 calories! Yes please! I drank the whole blender full!! I didn’t share, but I did give my Hubby a taste and he said, mmm, cherries. He didn’t want any because he was working outside and it’s only 32 degrees out. He thought I was crazy for making a frappe now. 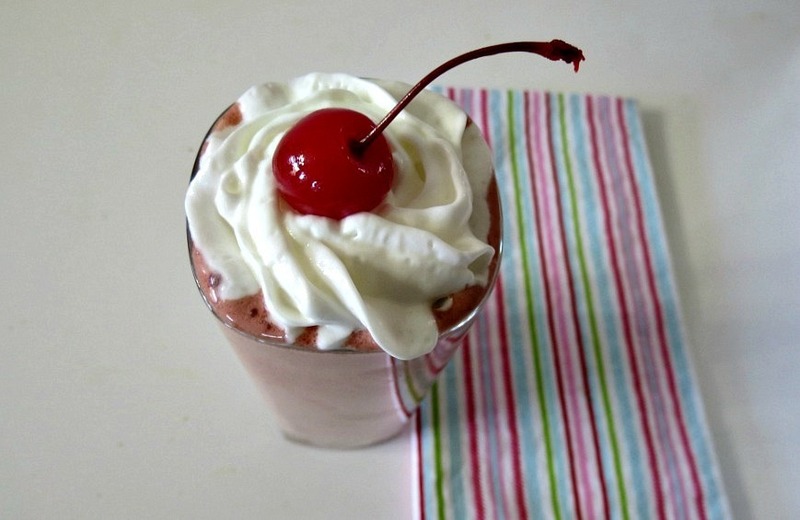 A sweet frozen coffee drink made with cocoa and cherries. Place all ingredients in a blender and process until smooth, about two minutes. I know I have said it before, but I do enjoy making frappes. I make one almost everyday, unless its super cold out!! 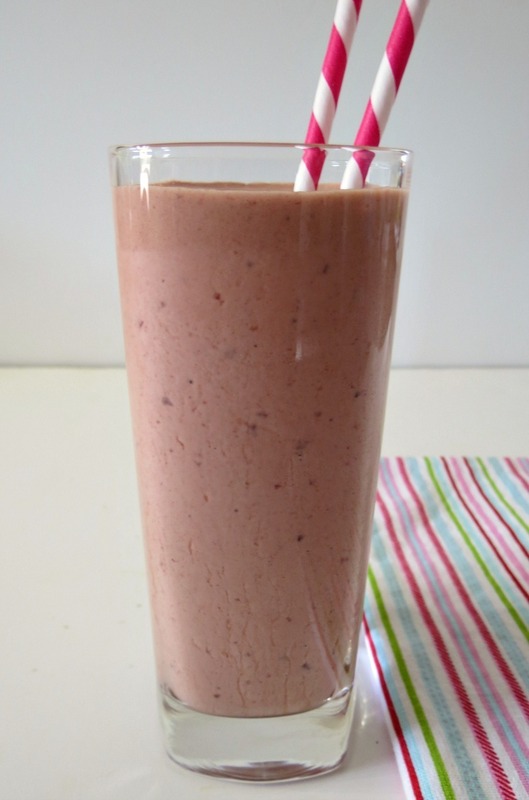 I was thinking if you want more protein to the drink, I am betting you can replace the cocoa powder with chocolate protein powder. So many ways with this drink!! You can also make this the night before. Just place the frappe in a freezer bag, put in the freezer and in the morning place it in the fridge. By the time you have your mid morning snack, it will have softened enough that you can mash the bag with your hand! Than pour into a cup! This will be cheaper and fewer calories than my Starbucks run! Well Guys, time to go! There are a lot of coffee beans out there that are thrilled! Knowing that the morning leftovers can have a DELICIOUS “makeover” ;)Redheads4ever! This looks like an unbelievably fantastic 46 calories! Love it, and thanks for the tip about the TJ coconut milk, i didn’t know about that! Your welcome! I love there coconut milk and I love that it’s guilt-free!! I agree with you, I still have frappes even though its January 😀 Can’t get enough, and I am dying to try this one! I can’t get enough Frappes, and it’s starting to warm up so I’ll be sure making them this weekend!! You enjoy your weekend! It’s suppose to be nice in the city! Awesome frappe. I loooooveee the combo of cherries and chocolate! This Frappe looks so yummy that even though it’s only like 30 degrees outside, I really want to go make one! I think I’ll try this instead of my hot coffee. Thanks for sharing at Creative Thursday 🙂 Have a great weekend! This looks absolutely delicious! I think it would make a perfect Valentine’s Day treat. Thanks Bonny! I am loving this drink! Your right it’s perfect for V-day! That sounds so good! Only 46 cals!? That isn’t even a splurge. Thanks so much for sharing on Super Sweet Saturday. Oh, your frappe sounds so good. Love the chocolate cherry combo. Saw it on Crumbs & Chaos. Would love for you to share on Thursdays Treasures http://fooddonelight.com/thursdays-treasures-week-69. Thank you for the invite! I linked up!! Have a great day! Visiting from the Super Sweet Saturday link up. This looks delish!! Thanks for sharing 🙂 Pinning! I have to save this recipe for warmer weather but It looks great! Thanks Danielle! For some reason I can drink frappes anytime of the year! 🙂 If you do try it out, stop back and let me know what you think! I could go for this even if it is the dead of winter and below zero here. Thanks for sharing on Foodie Friends Friday and hope that you will join us again this week with more awesome recipes. Thank you for sharing on Thursday’s Treasures! I’ve featured this on Week 70. Please stop by my blog and grab a “featured on” button. <3 and hugs! Thank you so much! I am honored you featured it!! Thank you, thank you!! YUMMMMMMY! I love cold coffee drinks!! Me too! No matter how cold it is out!! Thanks for the invite! I already linked up! thanks for linking up on Serenity Saturday link party. You have been featured! !